If you’ve never been snow tubing or sliding at Cypress Mountain, this is definitely the year to try it. And if you’ve been in previous years, their new pre-booking requirement is a game-changer for upping the family fun factor! When we’re planning a family outing, potential parking difficulties and the likelihood of long line-ups once we arrive definitely factor into our decision-making. That’s why Cypress Mountain‘s new pre-booking system for snow tubing & sliding this year is SO very welcome! In the past, when tubing & sliding were only available on a drop-in basis, it sometimes took up to an hour to find parking in their nordic area, followed by long line-ups at the sliding and tubing areas. 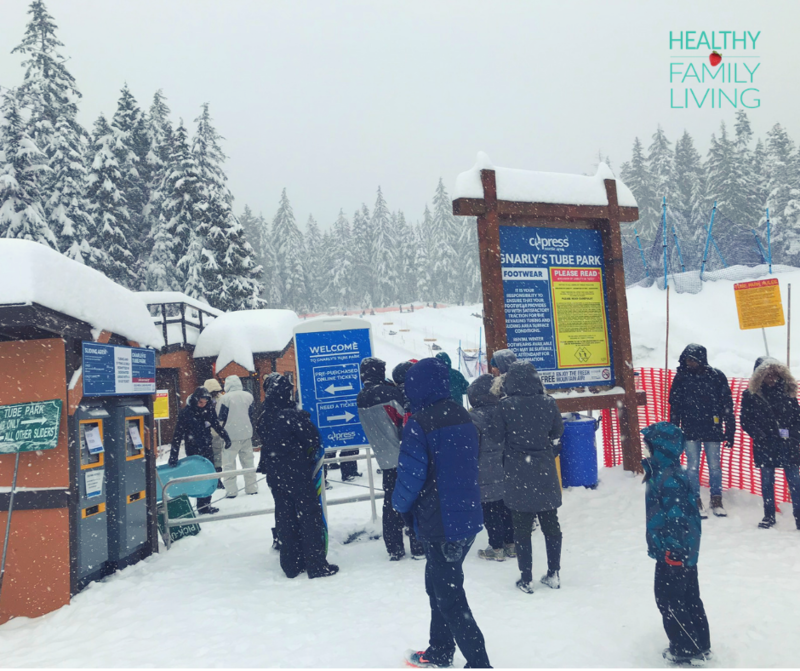 But with our pre-booked 2-hour timeslot this past December for a maximum number of people, parking was a breeze and line-ups at the top of the tubing hill were very short. 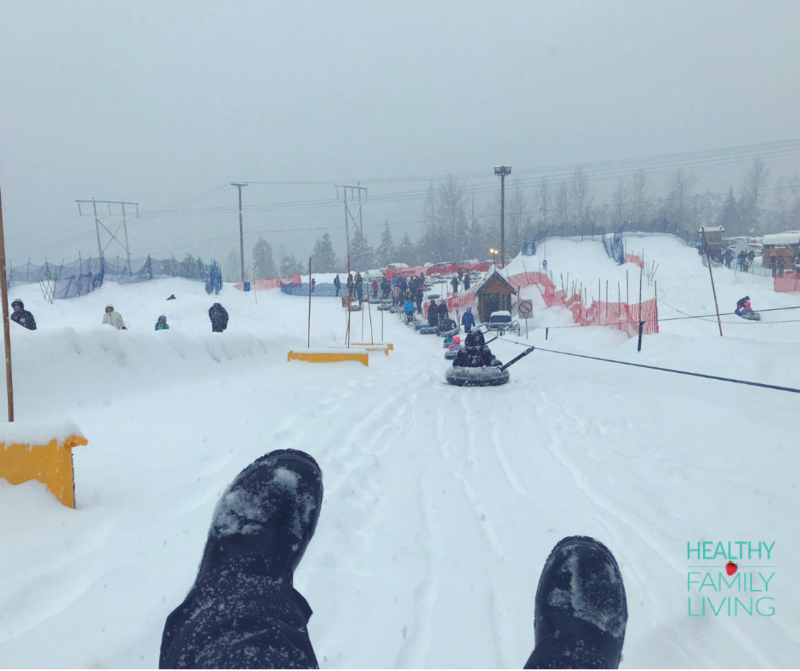 This allowed us to enjoy what felt like a million tubing runs, and it turned out to be one of our best family outings this holiday season – can’t wait to go back! With up to 6 chutes roughly 100 meters in length and a tube tow to do the work of bringing you back to the top, all you have to do is sit down and enjoy. 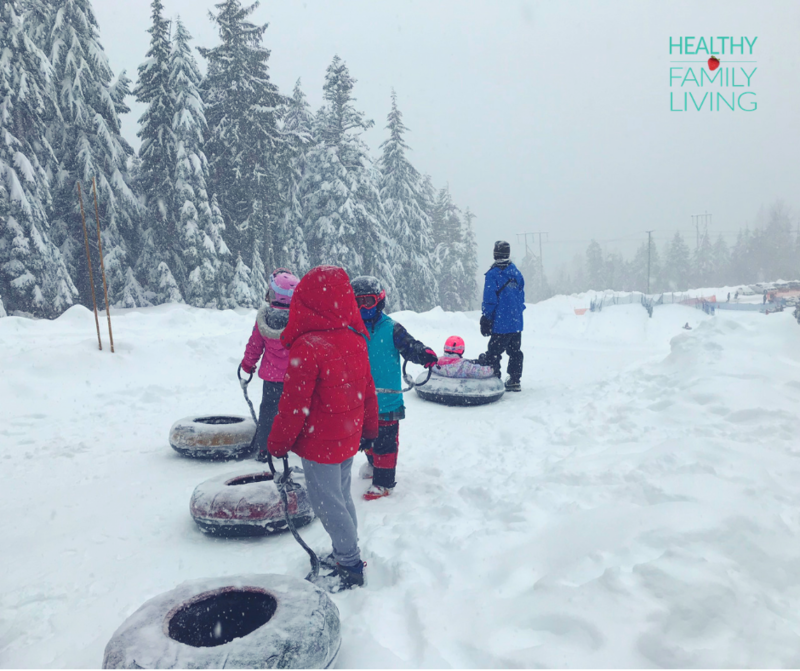 Below you’ll find our tips for maximizing family fun at Cypress Mountain‘s snow tube park! TUBING VS SLIDING: Decide between sliding or tubing based on your kids aged and heights. The sliding area is a gentle slope suitable for children under the age of 6, whereas all tube park participants must be 42″ tall or 6 years of age (whichever comes first). When our kids were 4 and 6 we used to divide & conquer (one kid & one adult on each hill), but now at ages 6 and 8 they’re both happy for us to hit the tube park as a family. CHECK CONDITIONS: Before you head up to the mountain on the day of your booking, check their Nordic Conditions page for most up to date conditions report and operating hours. ARRIVE EARLY: Plan to arrive at least 30 minutes ahead of your scheduled start time to allow for parking, getting the whole family geared up, and making your way over the hills. HELMETS & GOGGLES: If you’re heading up on a snowy day, wearing ski helmets with goggles can make the adventure more comfortable. They’re not mandatory for sliding or tubing, but we think they’re worth bringing! SLEDS & TUBES: If you’ve booked sliding, bring your own non-inflatable sled or purchase a magic carpet at the tube park. If you’ve booked tubing, no need to bring any equipment – they have a variety of tube sizes for all ages. 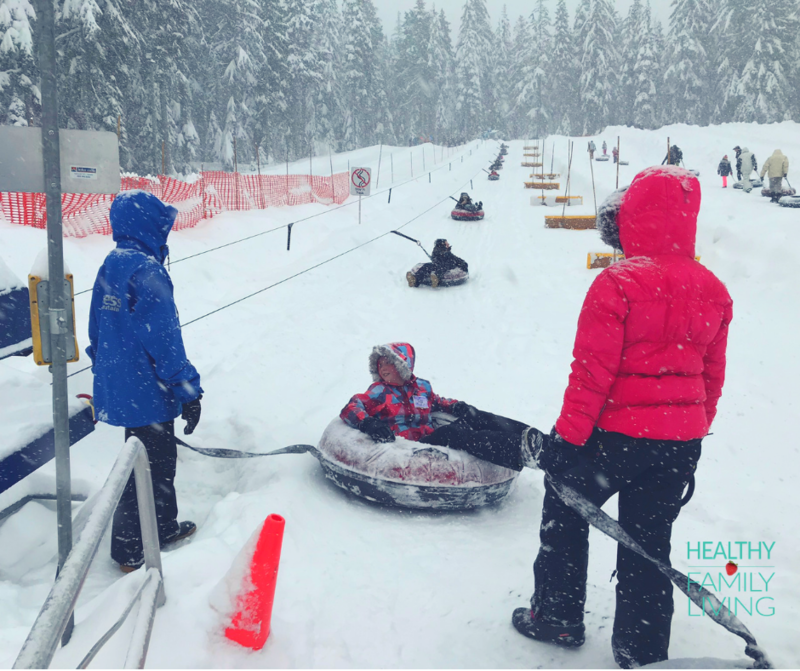 TUBE TOW: During your tubing sessions, try mixing up how you get to the top of the hill to sneak some exercise into the adventure – we like to alternate between walking up the hill pulling our tubes behind us and then letting the tube tow pull us to the top the next time! HOT CHOCOLATE: Bring a thermos of hot chocolate to enjoy on the hill, or grab a hot drink & quick bite in the Nordic cafe afterwards. BOOK AGAIN: When you’re back at home, book your next Cypress Mountain snow adventure. We’ve already booked ours! 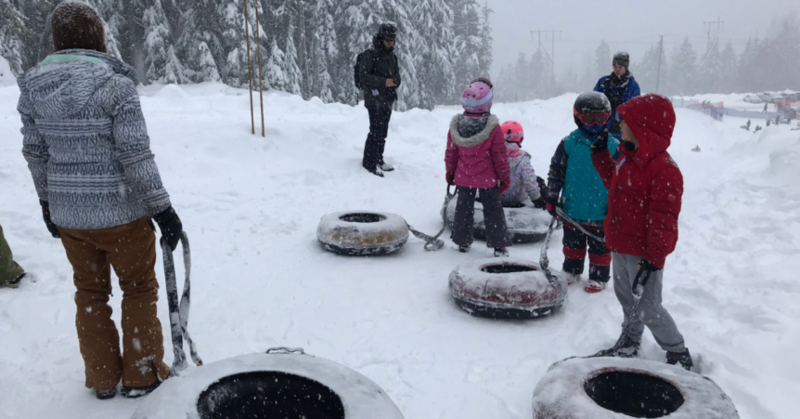 For more on our adventures at Cypress Mountain, check out our posts on Kids’ Snowboard & Ski Lessons, Snowshoe Fondue Date Nights and Skooter Camp Magic. Kids Can Shred: Snowboard & Ski Lessons at Cypress Mountain! Snowshoe Fondue Date Night at Cypress Mountain! Skooter Camp Magic at Cypress Mountain! thank u so much your article helped me out a lot!!! Love this! lots of useful information thx..